Most of the uses of knp refer specifically to wing(s). Nearly half (51 times) of the occurrences deal with angelic beings and emphasize the traditional translation of “wing(s)”: primarily the cherubim (in visions [18 times in Ezekiel 1, 3, 5, 7, 10, 11, 16, 17, 39] and “covering” the Ark of the Covenant [22 times in I Kings 6:24, 27; 8:6-7; II Chron. 3:11-13; 5:7-8]) and seraphim. Twenty-two actually refer to birds “wing(s)” whether literally or as figurative examples. Sixteen occurrences pertain to the clothing of a man and are typically translated as “corner; edge; border”. Four of the uses are in the account of David’s cutting off the corner of Saul’s garment as a witness to Saul that he held Saul’s life in his hands (1 Samuel 24:4, 5, 11) and perhaps the reason for this is to be found in the following analysis. Of special note are the two references in the Law to placing tassels (“tzitzith”) on the four corners of garments “to look at and remember all the commandments of the LORD, so as to do them and not follow after your own heart and your own eyes, after which you played the harlot” (Numbers 15:38-39; and Deuteronomy 22:12). This seems to bear out in relation to the NAS95 translational footnote of Matthew 9:20 (“tassle fringe with a blue cord”) in reference to Jesus healing of the woman with the issue of blood by her touching the corner of his clothes (the Syriac Peshitta has knp!). Was she actually reaching out to touch the tassles at the corner? Jesus would certainly have had tassles there indicative of his faithfulness to the covenant and so this seems likely to have been her reason for wanting to touch the knp of Jesus clothes…to somehow lay hold of this wonder-working covenantly faithful prophet and be healed…even if only by the visible symbol of his covenant faithfulness. Nine times knp occurs with God as the reference – three illustratively use wings explicitly (Exodus 19:4; Deuteronomy 32:11; Psalm 91:4). While the other six may in fact refer not necessarily to wings, but simply to his covering (garments?) even in one verse finding the specific comparison to being in his “tent”. Six also very specifically connect the phrase “in the shadow” to God’s knp where one may take “refuge”. In Ezekiel 16:8 there is a very noteworthy reference to the LORD’s covenanting with Israel by his throwing his covering over her to declare her as his own. The Targums primarily understand the meaning to be “that which curves or bends; thus wing(s) or something that covers”. 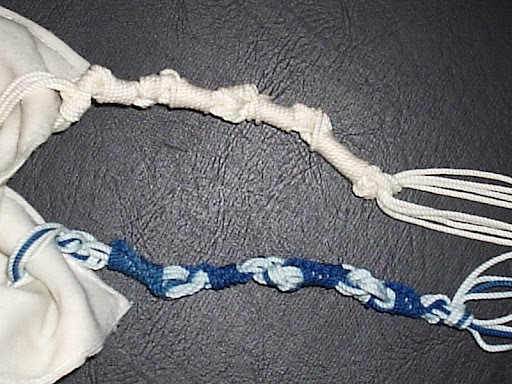 As to the Ruth 2:12 reference, the Rabbis understand knp to refer to the “faith” – that is the true and Jewish faith (Jastrow 651) and this would appear to be with reference to the tassles on the knp as indicative of covenant faithfulness. While Gesenius translates this particular verse in Ruth 3:9 as “throw thy coverlet over thy handmaid” and takes it to mean “take me to thy couch as thy wife” (Gesenius 406). He places it within the framework of the Deuteronomic law (22:30; 27:20; incorporating the prophetic picture of Ezekiel 16:8) of not violating one’s “father’s bed” by “uncovering his father’s coverlet” placing both under the primary definition of “edge, extremity”. There is considerable ambiguity in translating this particular term as can be seen by the various translations of Ruth 3:9 in the opening paragraph. The vast majority of the time the simple translation of “wing(s)” is to be preferred, but in the context of humanity (and possibly the references to God himself in most of the cases) this translation is untenable. knp in this context of Ruth should therefore be understood in reference to the corner of his clothing with special reference to the covenant reminder of the tassels and the later prophetic claim to God’s covering Israel in “taking her in marriage”. The use of knp offers great theological insight into Ruth 3:9 over against a simple “covering” of Ruth to keep her warm, she has asked Boaz to enter into the covenant of marriage with her and reminded him to be true to the covenant of the LORD in doing so…to which Boaz assents and follows through in becoming the kinsman-redeemer of Naomi through his marriage of Ruth. Gesenius, H.W.F. Gesenius Hebrew-Chaldee Lexicon to the Old Testament Samuel Prideaux Tregelles trans. (Grand Rapids: MI, Baker Book House Co., 2000). Harris, R. Laid, Gleason L. Archer Jr., and Bruce K. Waltke, Theological Wordbook of the Old Testament “KNP” (2 Vols. Chicago, Moody Publishers, 1980). Jastrow, Marcus (Compiler), A Dictionary of the Targumim, The Talmud Babli and Yerushalmi, and the Midrashic Literature (New York,G.P.Putnam’s Sons, 1903).